Description: BNSF 820 is former Santa Fe 820 on home rails but in its new owner's paint scheme. 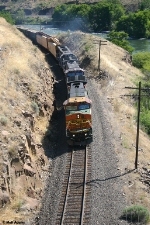 Description: 45 miles south of Wishram this southbound hugs the hillside on the Oregon Trunk above the Deschutes River. Description: The lone engine on the left is BNSF 5503 which was the leader on a Northbound that was at Oakbrook. Most of the passing siding are nearly impossible to get to via auto, so the crew, which was apparently in need of a shuttle, left their other 5 units and train in the siding at Oakbrook and came light down to the short stub siding here so that the crew van could get there too. Description: Eastbound BNSF Train H DENKCM9 10 passes the ex-ATSF Depot with ex-Santa Fe Power on the point, albeit repainted into BNSF Heritage II. Description: The DENKCM takes a rest in the siding while waiting on a westbound. Description: Engineer Jeremy and Conductor Ness came down to chat while they waited. They tried at least 5 times to contact the dispatcher, and it took over 15 minutes to finally get their track warrant into the depot. Description: The engineer invited us up to the cab while they waited for a track warrant from the dispatcher. Description: Thought this was cool. As the train went by the signal it dropped from green to red. 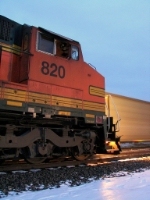 Description: BNSF 36th street yard.